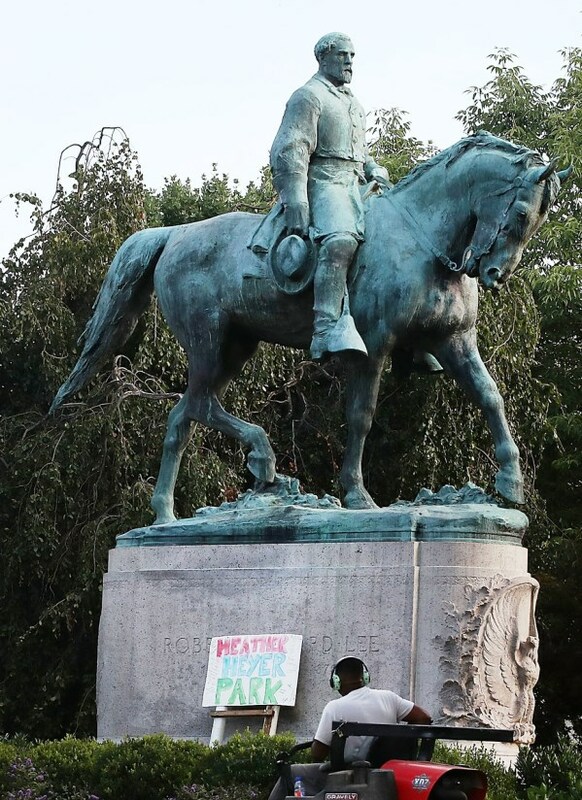 The constant struggle to control the past and the future by dominating the present took a new turn in Charlottesville, Virginia, over Robert Edward Lee’s statue. Now, public monuments are becoming polemical in Australia. Erecting and pulling down public monuments in democracies during peacetime provides a new battlefield, in stark contrast to the acts of armed men drunk on victory. In 2003, when the Americans bludgeoned their way into Iraq, they gleefully helped Iraqi citizens pull down Saddam Hussein’s statue while much of the world cheered. When the Taliban destroyed the Bamiyan Buddhas, most of the world wept. Karl Marx and Joseph Stalin’s statues received applause for being erected and demolished. 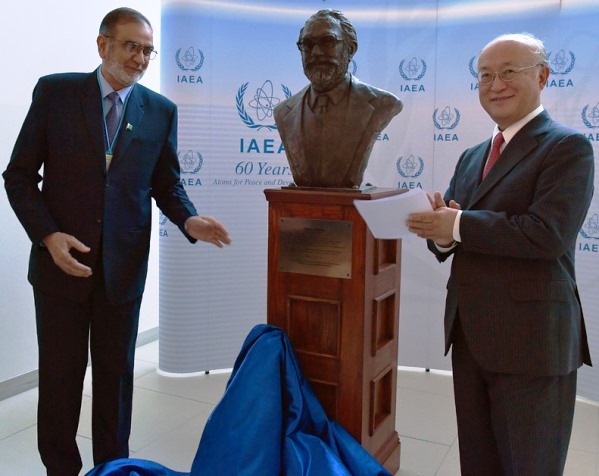 On September 21st, the International Atomic Energy Agency (IAEA) honoured Pakistan’s first of two Nobel Prize Laureates, Dr Abdus Salam, by unveiling his bust at their headquarters in Vienna. There is no report of whether or not an official Pakistani delegation was present, although the news was sourced to a Pakistani Foreign Office handout. Since Dr Salam has been denied any form of recognition in his birth-land due to his personal choice of faith, it is interesting to see how or whether at all the IAEA’s precedent will influence similar choices in Pakistan. Or will it fuel protests against a sovereign decision in a sovereign country to become an election issue? By the time the novel came out in 1949, Antonio Gramsci’s ideas of critical pedagogy and popular education had already started influencing competing ideologies to turn classrooms into curricular combat zones. Battling ideologies still seek to structure society by modelling unformed minds. In the US, attempts to dominate the present to control the past and regulate the future by polemicising public statues and monuments triggered a series of court cases and riots. The winners in the clash of cultural hegemonies will decide the fate of Robert Edward Lee’s statue in Charlottesville, Virginia. For some white southerners, Lee was a son of their soil who, for better or for worse, stuck with his own. But many African-Americans believe he only fought to maintain the status quo of slavery. Irrespective of how Charlottesville is finally resolved, resentment will not disappear but like a tennis ball, will keep changing court. For military academics worldwide, Lee was a brilliant general. Thus, it was as far away as Pakistan that my instructors at the Pakistan Military Academy (PMA) respectfully taught General Lee’s campaigns. They also lectured on the Apache Chief Crazy Horse’s battle manoeuvres and reverentially referred to him as General Crazy Horse. At the other end of the globe from the US, native Australians have raised the issue of the stolen generations. From the mid-1800s up until the 1970s, an uncounted number of Aboriginal and Torres Strait Islander (First Peoples) children were taken from their families without parental consent. These stolen generations were denied their language and culture and after minimum education, were used as unpaid child labourers or household servants. Others were forced to migrate from their ancestral lands to reservations. This cultural genocide has left deep scars in the Australian society. The Aborigines have to live with it and the descendants of the perpetrators have to live with themselves and decide how they define their past. A couple of ‘atonement’ monuments such as Colebrook Reconciliation Park and The Aboriginal and Torres Strait Islander War Memorial in Adelaide have been raised. While the latter needs no explanation, the former is the site of one of the homes where the stolen children were exploited. Yet, the plaque on the monument in the Reconciliation Park, achieved after a four-decade struggle by Aborigines, remains blank. In 1849, 200 men, women and children were killed by driving them off the cliffs of Waterloo Bay – that is the historical fact that justifies the monument. Why it cannot fill the blank plaque with a dignified sentence in plain English remains unanswered and speaks volumes about Australian good will. The Australian monuments, of course, positively correct and complement the existing perception of history, similar to the Memorial Gates in London, which show British respect for the South Asian casualties in the two world wars. 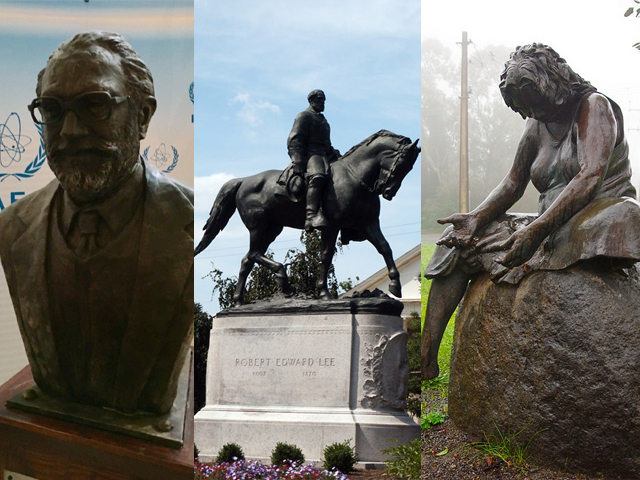 Decisions that do not tear down public sculptures to leave an eloquently blank space or replace it with a challenge are laudable. Erecting or pulling down sculptures celebrating a socio-cultural group’s heroes is fraught with danger. It must be ensured that no public monument sprinkles salt on another community’s wounds. Putting up a statue may honour one group while being a provocation for another. At the time a monument is put up, as in Charlottesville, the offended group might lack the muscle to protest. By the time it acquires the necessary political strength to do so, the monument might have become a cultural fixture of national dimensions. The ugliness of the battle lines will determine future divisions. The delayed challenge will then be perceived as present-day politics seeking to control the past and shape the future. Democratic institutions need the structural and organisational strength to sagaciously balance communal resentment. Furthermore, these institutions need to ensure a stable society that can provide equal opportunity to be articulate in the present, express perceptions of the past and seek to influence the future. The clashing interests of rival communities need to be juggled like tennis balls for democracy to succeed. As long as all the tennis balls stay in the air, communal resentment can be contained. A missed ball can trigger courtroom brawls, riots or worse. The US missed a tennis ball in Charlottesville. Nevertheless, it remains to be seen whether Australians will be able to keep theirs up in the air while Pakistan ruminates how, if at all, to publicly honour Dr Salam, one of its most distinguished sons. This is a very confusing blog. Jumping from here to there. Like a grasshopper. about how Charlottesville will be resolved, in the author’s mind. This is Good vs. Pure Evil. Good, every day, diverse, salt of the earth Americans against Nazis, KKK, White Supremacists, Alt Right, Bigots, Racists, Evil thugs. The White Hat heroes will win. There is no middle ground with Stark Evil. Non negotiable. an Apache. Perhaps the blogger has him confused with Geronimo, Cochise, or Mangas. The great legendary Apache Chiefs, Who invented guerilla warfare. They were from the South West of USA. A desert countryside. At the PMA, Kakul, hopefully, they are also perusing Clausewiitz. And for offensives Mannstein, Guderian, Rommel, von Bock, von Kluge, will suffice. this is a strange comment, indeed. Statue of Liberty…..give me your tired, your poor NY. Lincoln Memorial ….he abolished slavery Washington DC. Mount Rushmore……carvings of 4 humanists presidents. SD. Atlas [Rockefeller Plaza NY. ]…Atlas holding up a united World, NYC. Teddy Roosevelt liberal, humanist president Washington DC. Christ of the Ozarks…..Christ was for humanity. Arkansas. philosophy of individual rights and limited govern­ment. This is the philosophy on which the American Constitution and all Western political systems today are based. 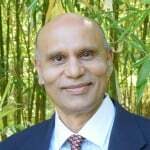 The white supremecy was justified in the US and Australia based on the virtual interpretation of the holy Bible where God of Ibrahim, the creator stipulates to humans to labour on the promied land for fruitation and livingwhich according to white Amricans the native Indians and aborigians failed to do. Th scriptures authorised slavery and therefore was regarded natural as well. If the author was to read General Lee’s paper of surrender it does not inspire bravery or respect. Human rights came to fore in Europe after renaissance and industrial revolutions as well enlightenment in interpretting christian bible. Sorry, John D. Horton is a USA citizen living in the Middle East and I have zero Indian blood. Good point!, There is no better historic monument in the US than that in washington, the white House which was built by black slaves. Mr Obama had the oportunity to rename it but than his forefthers were not slaves and enjoyed living in it..
You don’t get it, do you.? They are ALREADY up! And Stalin was a brutal dictator. Not a liberal or Left. I have no other option but to agree that it must be ensured that no public monument sprinkles salt on another community’s wounds. Stalin = Communist = Left?